Our fathers are in heaven now. As another Father’s Day approaches some of us feel a sense of emptiness and loss. Yet some of us, like Amy and I, celebrate lives completed. For when all is said and done, all of our lives are a story–with a beginning, a middle and an end–and our fathers lived happily ever after. Amy and I met just after our fathers had died. We were struck by all of the similiarities in our personalities and in our lives. We have this fear of water (we swear we must have been passengers on the Titanic), dislike of amusement parks. An intense love for cemeteries, history and magic. We love to dress up in period clothing. We love old houses and antiques. We want to go back in time. We married men with the same name (Mike) and even gave our sons the same name (Brendan). We are Italian, yet there is this common bond of early southern ancestry and Confederate soldiers in other family lines. There are even lines that show up in Salem, Massachusetts. But most of all, we share this unquenchable thirst to tunnel our way through our family histories and inevitably into the places where our ancestors now reside…the spirit world. There is a certain comfort we have in knowing that there is family on the other side. That if we know their stories, no one ever really dies. Especially our fathers–for they are our first link to everything that lies beyond. Both of our fathers’ stories begin deep in snow…with a Niagara Falls winter. Benjamin Salvatore was born on January 11, 1938, to Joseph and Pearl Salvatore. Robert Barthel was born a decade later on February 3, 1949, to Arthur and Ada Johanna Barthel. Research into our family histories has proven that even our grandparents may have made some connections. Amy’s father’s mother, Pearl, lived at 1350 Cleveland Avenue in Niagara Falls and my father’s father, Arthur, lived with his cousins, the Schmidt’s, at 1634 Cleveland Avenue. It’s our little joke that they were friends…perhaps one day our research will shed some truth on that. Ironically, our fathers both lost their lives to that dreaded disease, cancer, after retiring from the Sodium Department at Dupont. Some day we may find that they were friends…and that they had actually spoken of us–their crazy daughters! But long before the chemical factories and the cancer had claimed them, they took their children on a magic carpet ride through life. My earliest years were spent as an Army brat, traveling to different places, living in Europe. Amy’s father was a truck driver and her family moved over 20 times. Ben and Bob were men with a certain magnetic energy that has transcended death. Bob’s great love was sports and a good story. Ben was an avid hunter and fisherman. 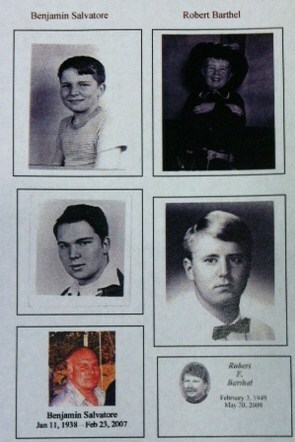 They loved their families and their grandchildren, especially. So on this Father’s Day, just a few years following our fathers’ deaths, Amy and I like to imagine that they are not really gone at all. In fact, they are our special guides when we search for the secrets of our ancestors and our past. And we are lucky to have them in that other place. Is she, or isn’t she…a relative of Mary Todd Lincoln? It’s your turn to find out. There is a grave at Oakwood Cemetery in Niagara Falls and a spectacular rumor has made it one of the most interesting stops on the grounds. For almost one hundred and sixty years a woman has kept a secret buried with her in Lot #231. The secret involves our First Lady, Mary Todd Lincoln. 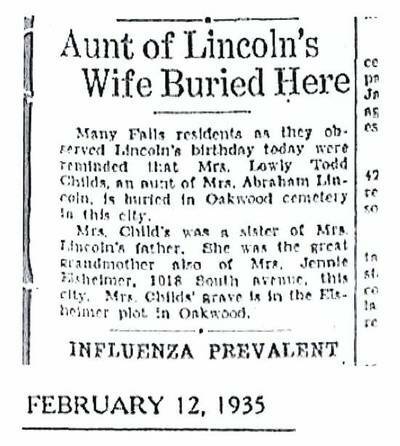 Is it true that Mrs. Lolly/Lowly Todd Childs, resident of Oakwood Cemetery, is a relation of Mrs. Abraham Lincoln? Various family members, throughout the years, have claimed that their ancestor was directly related by blood to President Lincoln’s wife. If that is true, then there is definitely cause for great celebration in the city of Niagara Falls. However, there are parts of the story that just do not add up. The time has come to put these ghosts to rest. Researchers and family members have been searching for the proof that would corroborate this story but have not been able to do so. So now it is up to you!